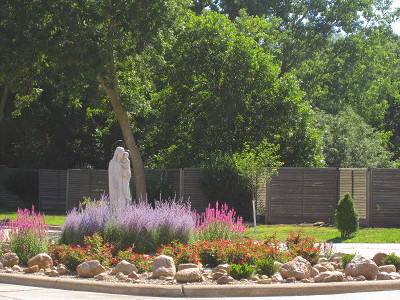 Every Carmelite monastery harkens back to the picturesque Mount Carmel in the Holy Land, just an hour’s drive west of Nazareth and overlooking the Mediterranean Sea. The origins of the Carmelite Order come from that very place, Mount Carmel, where crusaders and others settled into a common hermit life. Around the year 1209, they requested and received a Rule to live by. That Rule calls us to practice unceasing prayer in solitude, silence, and a spirit of evangelical vigilance. “The vocation of the Discalced Carmelite Nuns is a gift of the Spirit. Through it, they are called to a ‘hidden union with God’ in friendship with Christ” (#10). 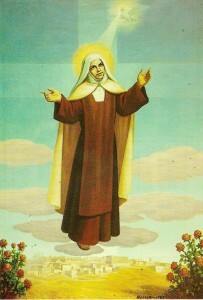 “The Discalced Carmelite Nuns are united with Christ who intercedes for us and offers Himself for us. With Him, they offer themselves to God, and complete what is lacking in the passion of the Lord in favor of His Mystical Body (cf. Col. 1, 24). 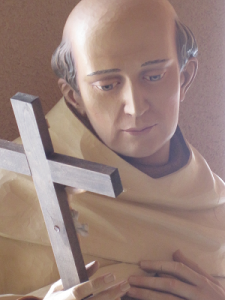 In this way, they open themselves to the action of the Holy Spirit who guides the Church and gives it life; and they move toward achieving that pure and solitary love which is more precious in God’s sight and of greater profit for the Church than a great many other works taken together” (#126). St Mary of Jesus Crucified (Maria Baouardy) is a marvelous flower of the Holy Land. She was born on 5 January 1846 at Abellin, between Nazareth and S. Giovanni d’Acri (Akko), of a Catholic Greek-Melkite family. She died in the Carmel of Bethlehem on 26 August 1878. She died on 26 August 1878. Her body rests in the Carmel of Bethlehem. 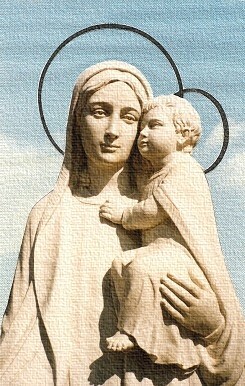 This humble daughter of Galilee, fellow citizen of Jesus and Mary, was declared Blessed on 13 November 1883. 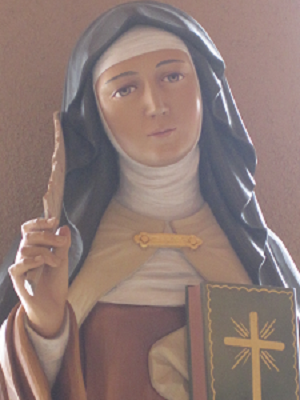 On May 17, 2015, Pope Francis declared Mary of Jesus Crucified to be a Saint. 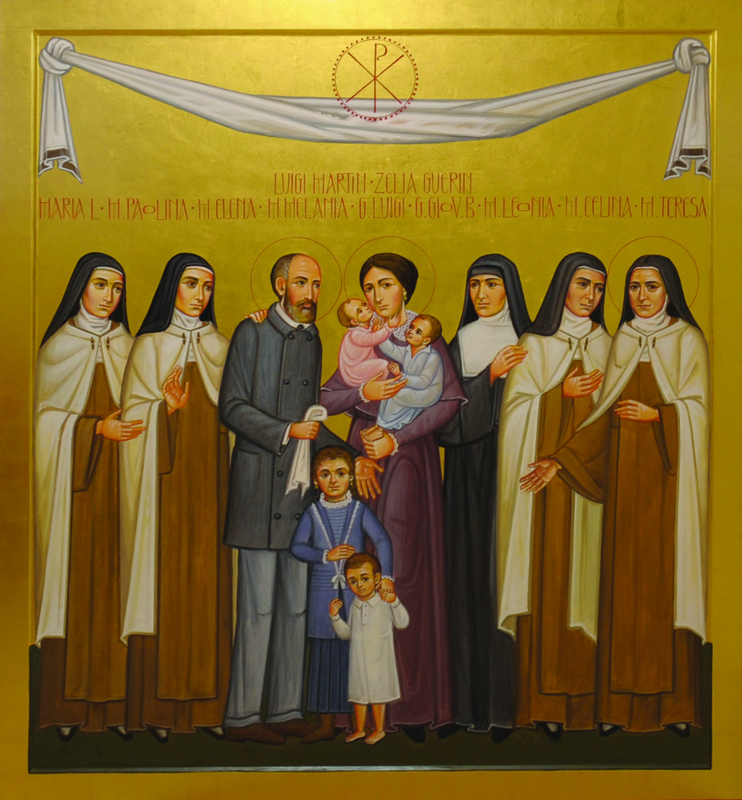 This icon of the Martin Family, Icona della famiglia Martin, was written by Paola Orlando of the Diocese of Milan and is reproduced here with permission. Canonized October 18, 2015, Saints Louis & Zélie Martin are pictured here with their nine children. 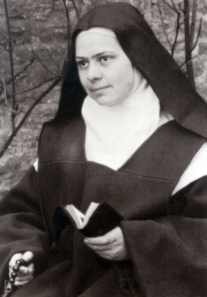 Four of the children died very young while the other five lived to become religious: four Discalced Carmelite nuns, including our St Thérèse, and one Visitandine sister, Léonie. 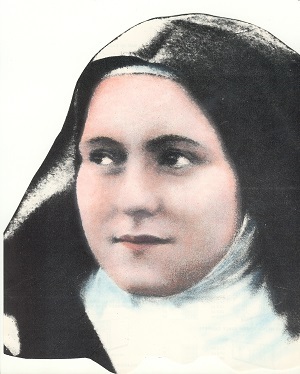 We’re hoping Léonie, who embodied St Thérèse’s Little Way, will be the next Martin Saint! than in our modern restless world."